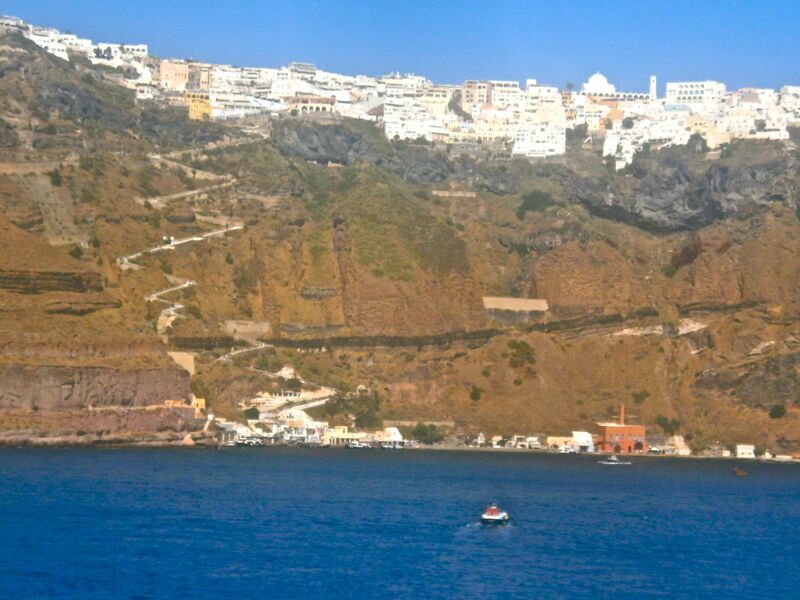 I visited the beautiful Greek island of Santorini as one of the stops on my Crystal Cruise a couple of years ago and although I wrote about Fira (the main town) then, for some inexplicable reason I’ve never got round to posting it here. 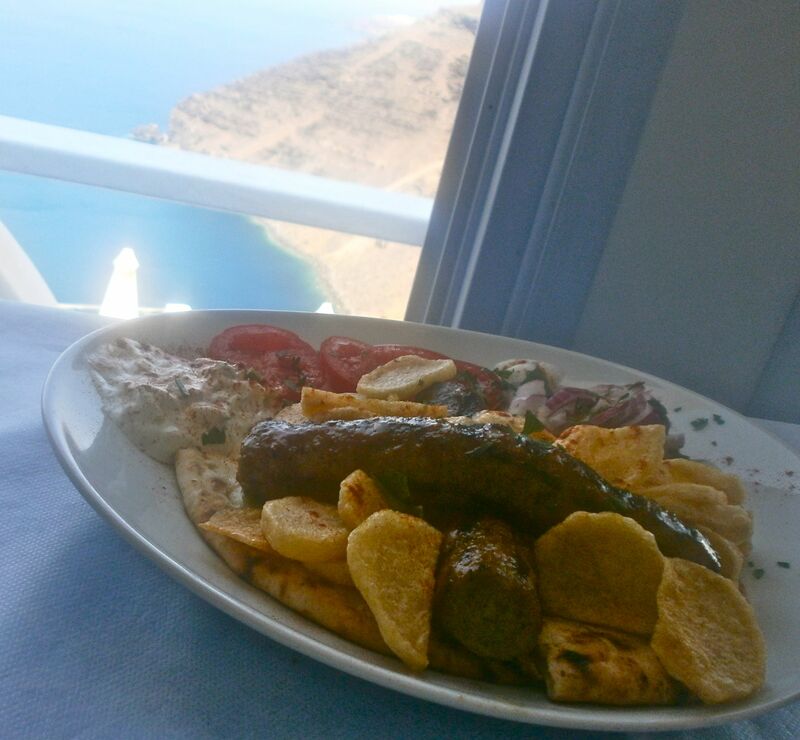 So, better late than never, here’s the story of a fabulous Greek town perched on high. 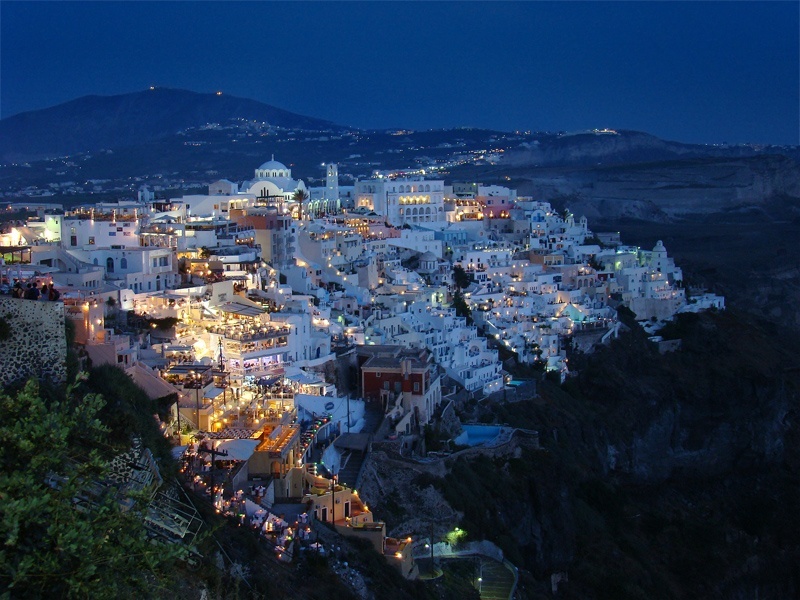 Fira (also called Thera or Thira) is Santorini’s main town. Perched high atop a towering cliff, it beckons temptingly. Everything about this totally unique place, literally on the edge, is spectacular – even getting there from the quay once we disembarked from our ship. You have three choices. Take the funicular – a small, creaky structure that climbs vertically up the cliff face (a little scary! ); ride a donkey up the zigzag road or walk the same track, dodging said donkeys. I opted for the funicular and shut my eyes for most of the (very short) journey. Once you scramble out of the little car, it’s like you’re living a fairytale. 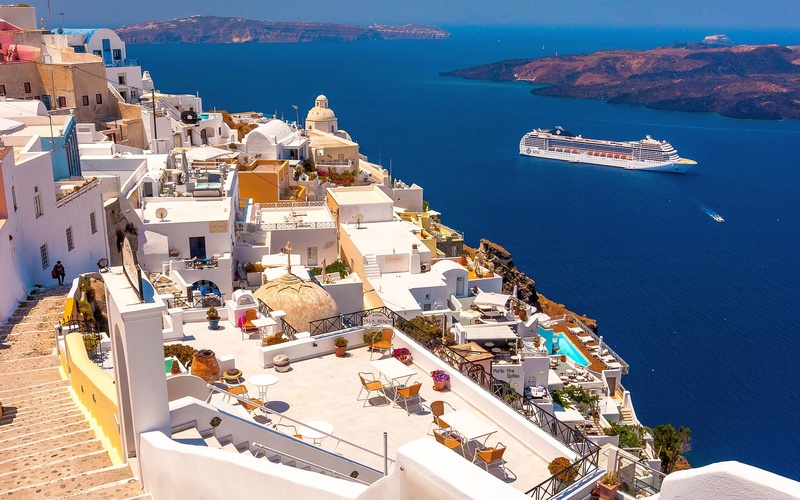 The blue sea glitters below like a field of sapphires and the stylishly whitewashed buildings gleam around you. You’re up on high in what has got to rate as one of the most beautiful towns on earth. Ambling in awe through the precipitous, winding streets you stumble upon all manner of delights. Shops spill over with stunningly colourful ceramics, summer shoes, jewellery and a myriad of handbags. Prices can be high but the charmingly cheerful traders are more than happy to bargain. We learnt how to say thank you in Greek by memorising it phonetically in English (eff-curry-store) and that made the perfect ice-breaker. It’s a fun shopping experience with some really unique (that word again) goods on offer. Although the town isn’t large (part of its charm), when it comes to time for some much-needed refreshment, there are certainly enough tavernas to choose from. 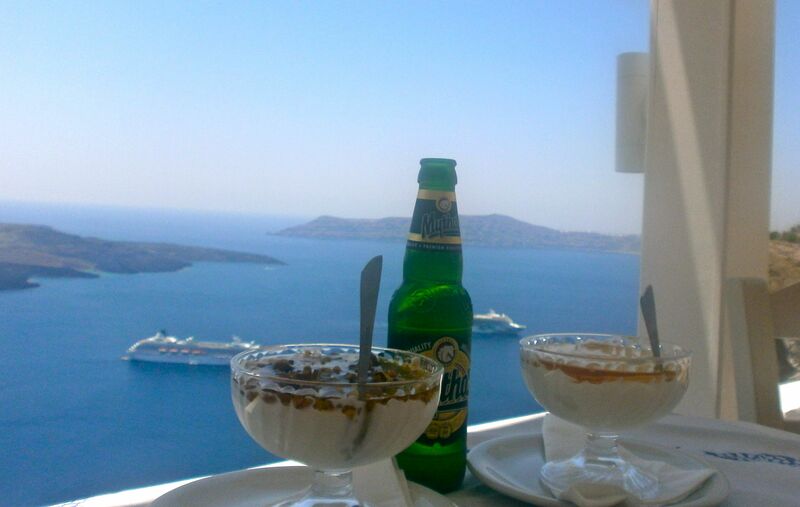 The chilled local beer tasted like nectar and the huge dishes of Greek yogurt and honey were simply heavenly. For lunch, the juiciest of lamb sausage, amazing salads, freshly caught local fish and what could have been the best spinach pie in Greece (can’t say for sure as I haven’t tried them all…yet, anyway). And a wonderful bottle of Santorinian wine, aptly all in that dazzlingly Greek trademark blue. The Santos winery is only five minutes drive away and, again, offers something special with the vines woven into a circle forming a basket. When it’s time to leave, it’s hard to tear yourself away, especially as the queue for the cable car down can appear alarmingly long when the cruise ships are in town. Actually, it goes quicker than you’d imagine, transporting about 36 people every five minutes or so. But not being great queuers, we decided to zig the zag to the sea. Now that’s an experience…slip-sliding along in flipflops, dodging donkeys and their poo – like everything else in this magical town, it’s certainly memorable. Though I was pleased to see the back of those donkeys who do have minds of their own and break out into regular mini-stampedes! It’s like they were trying to escape, while all my instincts were doing was telling me to stay. For a very long time. This place is stunning! And the food looks divine! Really worth visiting Rachel – and the food was exceptionally good.